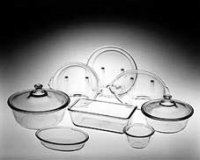 In 1915, Corning Glass introduced the first glass ovenware, made of a new, clear, heat-resistant material, Pyrex®. Its cooking potential was discovered in 1913 by Dr. Jesse T. Littleton of Corning when he provided his wife, Becky, with a makeshift casserole out of a cut-down Nonex battery jar. Surprisingly, it survived the oven as well as traditional ceramic casseroles. After Corning revised the original Nonex formula to remove the lead (dangerous in food products), the ovenware was successfully tested by Sarah Tyson Rorer, Director of the Philadelphia Cooking School and culinary editor of the Ladies Home Journal. The first product produced was a circular nine-inch "pie" plate (some say leading to the name"pie-rex"). Others say the name Pyrex was a technical derivative of the Greek "pyra" (for hearth), and the "ex" ending which had valuable brand-name similarity to Nonex. But what was Nonex? It was a "low-expansion" glass developed in 1908 by Dr. Eugene Sullivan, the first Director of Research at Corning Glass Works (founded 1851), to reduce product breakage. As a doctoral student in Leipzig, Germany in 1900, he had learned of experiments using borosilicate glass at the Jena Glass Works by Dr. Otto Schott, and applied this knowledge. The glass was used in weather shock-resistant lantern globes, and battery jars called Corning Nonex (for non-expansion). The same year Pyrex was introduced, a coffeemaker using it was marketed, using the "Silex" vacuum-drip principle. The name "Silex" was explained: "Sanitary and Interesting method of making Lucious coffee. It is Easy to operate on account of its being X-ray transparent." The design had originated in Europe, and rights were obtained in 1909 by two sisters, Mrs. Ann Bridges and Mrs. Sutton of Massachusetts, who had it manufactured by the Frank E. Wolcott Mfg. Co. The company became the Silex Company in 1929, was acquired by the Proctor Electric Company in 1960 and re-named Proctor-Silex, which in 1966 became a subsidiary of SCM Corporation. In 1930, Pyrex was used for Corning's Range Top Ware, introduced to the market. In 1934, Corning marketed clear Flameware stove- top pressed glass cookware including saucepans and skillets. Glass utensils could now be used for cooking as well as baking. In 1938, double boilers, teakettles and coffee percolators were added, with detachable glass handles attached by metal bands. The line was produced until 1979. In 1941, the Chemex coffeemaker, invented by Dr. Peter Schlumbohm, was produced by Corning Glass in Pyrex®. The unusual glass flask design was patented by Schlumbohm in 1938 using an ordinary Erlenmeyer chemical flask, funnel, and paper filter. It became an instant success and the prototype for many future coffeemakers. In 1948, Corning Glass established an internal design department in New York City, under the direction of John B. Ward. His first assignment was to redesign Pyrexovenware and Flameware . In 1953, Pyroceram, a white ceramic-like material capable of withstanding enormous variations in temperature, was invented and developed by Dr. S. Donald Stookey of Corning research and development division. Corningware, an oven-to-table service made of Pyroceram was introduced in 1958 by Corning Glass. It featured the first little blue Cornflower decoration, designed by Corning staff, which became the trademark of Corning consumer products for three decades. In 1965, the Terra line of bake-serve ware, by William M. Curtis of Corning Glass Works, won one of the last IDI annual design awards. In 1968, Pyrex Store 'N' See ware, designed by R. Greer, Allan Samuels and S. Balbach of Corning staff, was introduced by Corning Glass Works. The same year, Corning also introduced a "Counter-that-Cooks" electric range made with a Pyroceram cooking surface, designed by Corning staff designer Jerry E. Wright. Under the smooth glass surface were four unseen heating elements. With it, Corning provided a set of Cookmates, special pots with ground and polished bottoms to assure perfect contact with the heat source. The product line was refined into "3 plus 1" cooktops, which enabled ordinary pots and pans to be used, and in 1976 was sold to Amana. By the 1990s, all major manufacturers had a similar black "glass-top" range. In 1970, Corelle LivingWare , a dramatic new break-resistant dinnerware, fabricated of two different glass compositions laminated into a three layer sandwich, was introduced by Corning Glass Works, which promised to replace, free, any piece which broke within 2 years. Its authentic china-like "ping" quality demolished forever the low-cost plastic competition. By 1972, sales passed 60 million pieces, and by 1996, 2 billion. In 1973, Corning Glass Works decentralized and created seven design centers and with a staff of 26 under Director of Design Robert Ivers.